As we learn more about the concussion issue there are people trying their hardest to provide as much protection as possible for those that play the game. From new assessment techniques to proper rehabilitation of the injury there is a myriad of different ways we can help out. The most important is erasing the stigma and educating all those involved in sports, particularly football. Right now (and for the discernible future) there is no equipment, including helmets, that can protect/attenuate/prevent concussions, it is just a physics impossibility. However technology has come a long way in reducing the force transmitted to the head via helmets, with Riddell, Schutt and Xenith being the main focus and Rawlings a recent entry. There have been a lot of people looking at auto racing helmets for their ability to disperse forces, but there is a problem with them. Once an auto racing helmet is in a crash it is no longer viable; the force absorbing technology is designed to sustain a massive insult – extreme G forces over a longer period of time – but not repeatedly, as the main focus of this protection is for skull fractures. In football there is severe enough collisions that would warrant the technology but the impracticality of the auto racing helmets: weight, durability and cost eliminate that as an option. That could all be coming to an end as Bill Simpson, a highly regarded safety expert in the racing world, has developed a new helmet. I have been able to track down that Simpson IN FACT has created a helmet. As of this posting neither Simpson nor his company, Impact Racing, have commented on this – to anyone. Due to the shroud of secrecy around it I reached out to the other helmet companies, Schutt was the only one to comment (there will be more added as they appear). It is not only Austin Collie that is donning this headgear for battle on the gridiron, but there are others that have been spotted with it on as well, including Troy Polamalu. Some may have heard that this helmet is the Rawlings Quantum, but let me be the first to tell you that it is NOT a Rawlings. A person close to Rawlings (they are not part of Rawlings but has knowledge of the helmet) told The Concussion Blog that the helmet pictured is not a Quantum. Sources very close to Simpson have told The Concussion Blog that the helmet pictured in the Collie 4.0 post is designed/made by Simpson and/or Impact Racing, through a collaboration with the Indianapolis Colts and some other players. 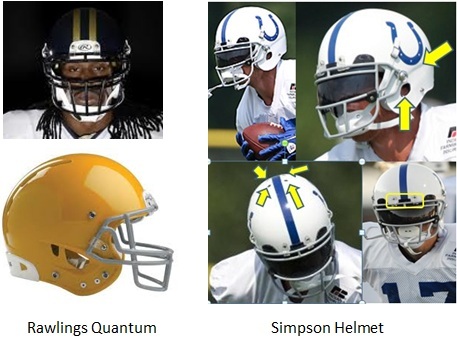 As you can see in the picture below there are distinguishable differences in the Quantum helmet and the Simpson helmet. Simpson and his team have partnered with Chip Ganassi Racing to produce the prototype, name yet unknown. There are a lot of unknowns about the helmet as a mater of fact. What is the shell made of? What comprises the interior of the helmet? Does it have sensors or telemetry built-in? Who is going to produce this helmet once Simpson/Ganassi are satisfied with the prototype? Bill Simpson along with Chip Ganassi has brought auto racing helmet technology to the best 100 yards of grass on earth. Now only time will tell if it will make a difference. I am also willing to bet that the current helmet makers are drooling for his information. If Bill Simpson has a hand in it–the players will be safer than they have ever been!! Being a super fan of football, I couldn’t be more happy! Finally someone is actually worried about the well-being of the players!! Bill Simpson sold Impact Racing to Mastercraft last year so he could concentrate soley on this project. That was what he told us at the Indy Motorsports Show last year.. I want one of these helmets……..how much and where do i get one? We should add padding to the outside of the helmet. I’m sure the NFL has their palms out for an endorsement, rather than the safety of the player! NASCAR Media racked Simpson over the coals over his seatbelts causing the Death of driver Dale Earnhart. The truth was Simpsons seatbelts were changed by Earnhart’s keepers at the request of Earnhart. Simpson makes quality products. You never hear the NFL or any other football program, bashing the current makers of helmets, due to the amount of money given to those organizations to the leagues. I have been incontact with SG helmets. My son has had 3 concussions from sports and is 10 years old, reason why I was looking into this helmet. I talked with the sales person who got me incontact with the GM (Scooter). Both employees were very helpful and we even went to Brownsburg to visit and get more information. My sons head is large and would not fit any of the standard helmets that they had. Scooter was going to talk to the engineer to see if they could modify the lining so my son could finally have a proper fitting helment. In talking with the GM everyone was on board in getting this done. The engineer is the only one not on boards as it would take to much time unless we wanted to pay an extra $1000. When talking to the GM in asking about the custom liner to fit his head we were told about an additional $25. As I was told this is one of the reason they got into this business. To help out the youth. To me it is appearing to be the next mass producer of helments. There target group is the younger ages not the NFL or no big colleges. I like they do not pay the NFL players to wear their helmets that is saying alot. Well back to my situation basically at this point I have only seen all talk. Very nice people but with me I am not feeling to good about them.